Why not try it now and receive a FREE vehicle valuation (where possible). Offer ends soon so hurry! *Cost £3.00 charged at 2 x £1.50 text messages received plus standard network charge. 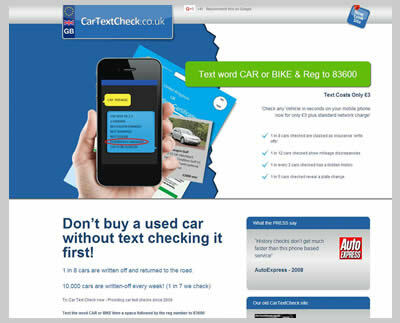 Information provided by MyCarCheck as seen on TV. 0330 3310032. This is not a subscription service. Incorrect or unknown entries are not charged.